bl.uk > Online Gallery Home	> Online exhibitions	> Asia, Pacific and Africa Collections	> One-Tree Hill, Secunderabad. 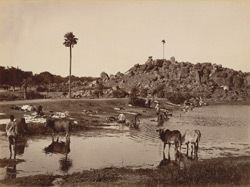 Photograph of a rocky hill with a single palm tree in Secunderabad, taken by Deen Dayal in the 1880s. This image is from the Curzon Collection: 'Views of HH the Nizam's Dominions, Hyderabad, Deccan, 1892'. In the foreground of this view is a rural scene of people washing clothes in a river at Secunderabad. Lala Deen Dayal (1844-1905) took up photography in the 1870s and in 1884 became official photographer to the Nizam of Hyderabad, with studios in Secunderabad and Indore.